So this week I am 28 weeks pregnant and have to have a few injections and tests. I have had a flu jab and will have to have the whooping cough injection next week and I also have had the glucose intolerance test to check whether this baby will be big like my last one! This test meant having a blood test, sitting still in the doctors for two hours and then having another blood test. It was went quite fast so that was OK. I only have about 12 weeks to go now so not long left. Just need to get my head in gear with sorting the things for the baby and trying to get ahead for Christmas! Today’s card is for one for a boy. It is one of a few cards that I have made over the last few months, when I have felt up to making a card, that I haven’t posted on here yet. It is quite simple as it doesn’t have too much embellishment but has colour and pattern going on instead. I’m not very good at colouring in the images so just kept it light. 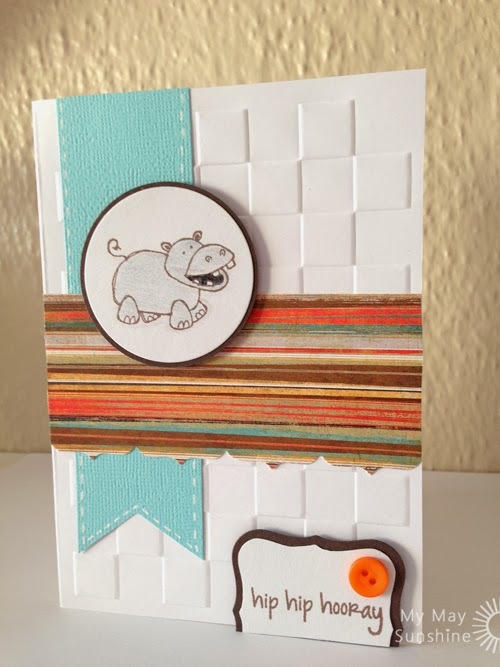 Paper – Basic grey Max and Whiskers | Card – American Craft | Stamp – Hero Arts Playful Animals | Embossing Folder – Triboss Chequered | Label – Spellbinders Nestabilities Label one | Button – Sew Sweet | Border Punch – Fiskars Upper Crest. Hope you had a good weekend and are looking forward to the week ahead.